The workmen have been busy on the western end of the old tennis courts since February. The old hard-standing surface, which, after three decades of disuse, was in a broken and unsafe condition, has been removed, and replaced with a figure of 8 path circuit. The base and edges are in place. 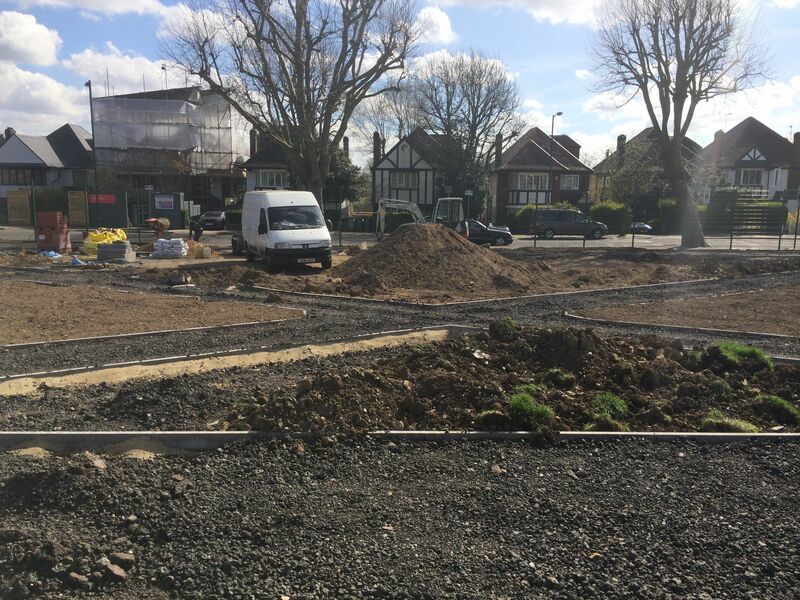 The areas in between and around the paths will be planted with grass seed, providing a safe and fun place for youngsters to learn to ride their bikes. Work should be completed on this section by late spring / early summer. Brent Council provide an hour’s free gym instruction on Tiverton Green every Tuesday morning. Just turn up and a qualified instructor will teach you how to use the equipment properly to get the most out of it. The lessons are suitable for all abilities, and are a great way of getting that little bit of extra motivation some of us need. Five other outdoor gyms are across the borough – details here. From July 2014 Thames Water will be undertaking some major local works, affecting us all, but especially users of Tiverton Green and residents on Okehampton, Wrentham, Tiverton, but also Crediton and Dundonald. Ultimately, the traffic disruption will affect large numbers of users in a wide area for a long period. They will be holding information sessions, the first of which is this Saturday 22 March from 11am – 1pm on Tiverton Green. This work is necessary owing to 30-40 properties – including the Tay Building on Wrentham, the church, the Manor School and many residential properties in the area – having suffered flooding with sewage mixed with rain water. The sewers are not large enough to cope with the sudden Summer downpours we’ve been experiencing recently. Thames Water needs to rectify this by widening the sewers under many of the streets and creating a massive ‘overflow’ tank underneath the north-west corner of Tiverton Green. This tank will need to connect in to the existing wide sewer under the Tiverton Road/Wrentham Avenue roundabout, so temporary lights will be in place at that junction for several months. The junction of Okehampton and Chamberlayne will also be closed for many months, so there will be significant impact on local traffic flow. Local residents will be receiving letters from Thames Water on 19th/20th March. Do try to come and find out more – and, importantly, let them know of problems you might highlight.